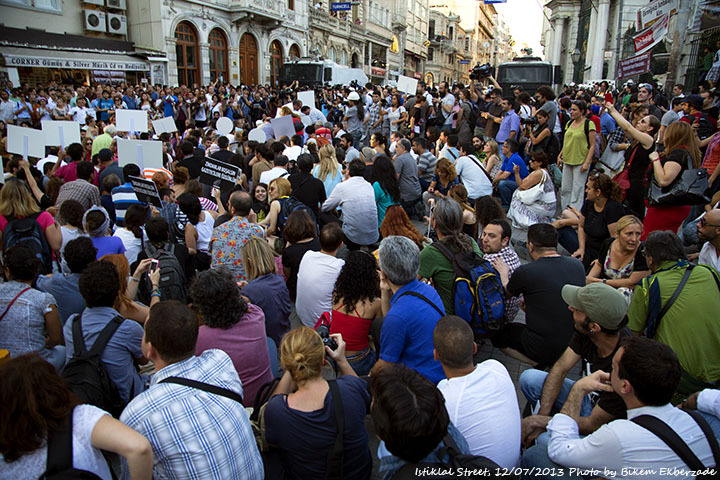 Journalists stage a sit-in on Istiklal Street, protesting media censorship, and the firings of colleagues. July 12, 2013. Many a times it was mentioned in the journals that the Turkish government was caught off-guard by Gezi Park protests. That they were unprepared, and were not expecting anything like this. That it was so out of their league. Well, it was monstrously true. There were no archaic slogans, the demonstrations and the demonstrators were like a changeling. You gassed them, they laughed. You hosed them down, they came back with their bathrobes. However it was not only the officials that were caught off guard by Gezi. The mainstream media was a total deer at headlights. Change, for some time, had been taking a heavy toll on the conventional international news outlets as we know them. Two of the powerhouses that I always called my second home closed down, one local, the Boston Phoenix and the other international, Newsweek in print. Legendary radio stations were calling it a day, the small where profitable was getting bought, the large downsizing at best, closing down when downsizing didn’t do the works on the checks and balances. The word on the street was that they were being swept off by the digital medium. The financial crises across the globe had slashed advertising returns, the true sponsors of the monthly paycheck. While this was happening abroad, in Western media mostly, Turkish media was also getting slashed, Rwandan style. Those that covered the genocide in Rwanda will remember, there was the evil press, and then there was the seemingly not so evil, per say, but when looked closely the wolf-in-sheep’s-clothing press. The latter acted as an independent news outlet, but in fact, behind closed doors it was closely affiliated with the government, looking like friend, acting like foe. While the media companies were changing hands at lightning speed, with Walendas being assigned by reference and on approval, they were also trying to adapt to the digital era. But they were too hefty, bulky, hasty, and slow to adapt quickly. Most seemed to think putting up a digital version of their daily paper online, and creating an app for a tablet was enough. But in days of twitter, of people, not necessarily journalists, but the average joe reporting from his/her smartphone, the large news conglomerates were soon out of the game. And so was the Turkish mainstream media. Coupled with fear from retribution, and perhaps even a disdain to the events taking place in Taksim square, mainstream media chose to bury their heads ostrich-like and wished it would all go away soon.